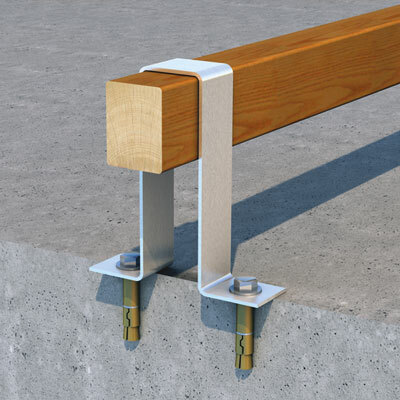 K7 or K8 40 x 3mm straps secure the seat by holding it down over the bottom cross-rail at each end of the seat onto a concrete pad or large paving slabs (ideally 600 x 600 x 50mm). 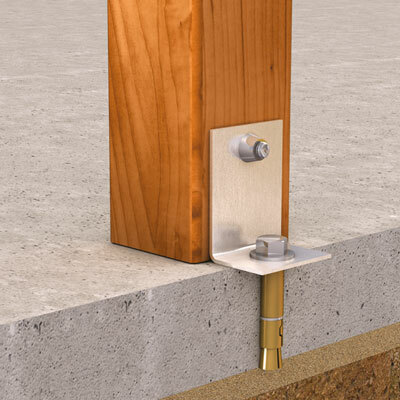 They can be used in conjunction with K1 or K1T rawl bolts to make a bolt down kit. They allow some lateral movement of the seat, making it more difficult for vandals to kick out the back slats. The seat is placed in position with the straps placed over the bottom cross rails, and the four hole centres are marked. The seat is then removed, and the holes are drilled with a 16mm masonry bit in a rotary percussion drill. The seat is returned to position and bolted down. The straps and all the bolts are in stainless steel. K7 and K8 kit has two straps. 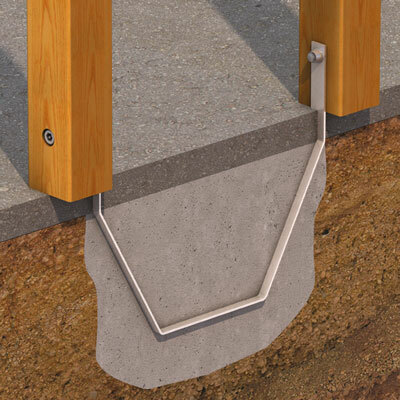 K20T has four 40 x 3mm brackets to bolt the seat onto a concrete pad or large paving slabs (ideally 600 x 600 x 50mm), allowing no movement. They can be used in conjunction with K1 or K1T rawl bolts to make a bolt down kit. The counterbored holes for the 8mm socket cap head bolts are pre drilled in the seat legs, making installation straightforward. The seat is placed in position with the brackets attached and the four hole centres are marked. The seat is then removed, and the holes are drilled with a 16mm masonry bit in a rotary percussion drill. The seat is returned to position and bolted down. The brackets and all the fastenings are in stainless steel. K20T has socket cap head bolts with tamper resistant shear nuts. K6 straps, which secure the seat by holding it down over the bottom cross-rail at each end of the seat, are made from 40 x 3mm stainless steel, and extend 225mm into the ground. They allow some lateral movement of the seat, making it more difficult for vandals to kick out the back slats. The seat can be placed in position, and an area marked out between both pairs of legs. The seat can then be removed, and the holes excavated. 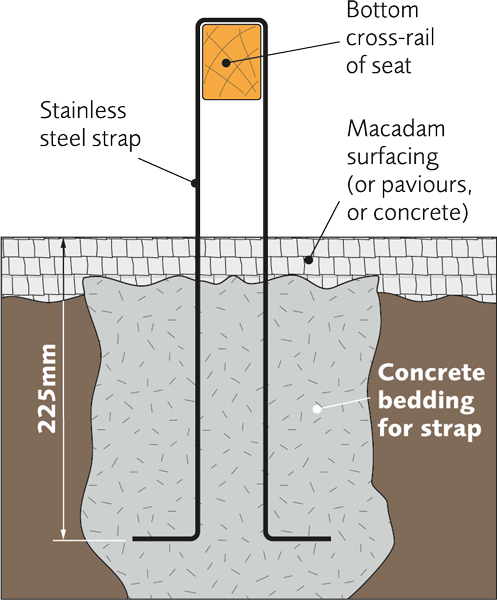 The seat is returned to position, the straps put in place, the two holes back filled with concrete around the straps, and the ground surface made good with macadam, paviours or concrete. 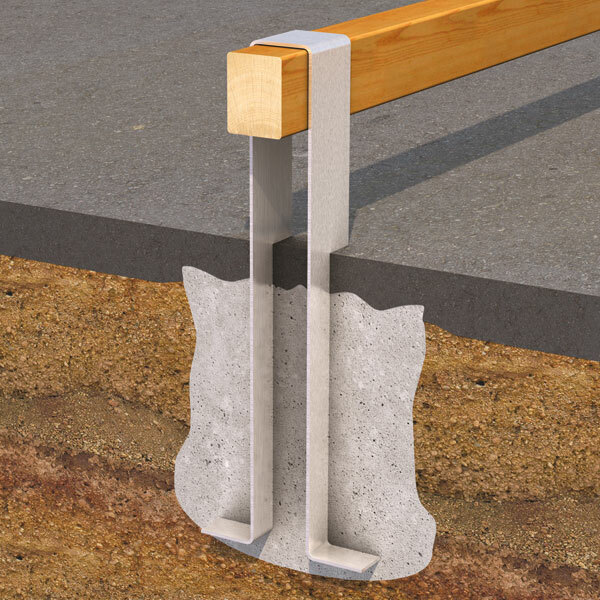 These 25 x 3mm brackets extend 225mm into the ground, and allow no movement of the seat. 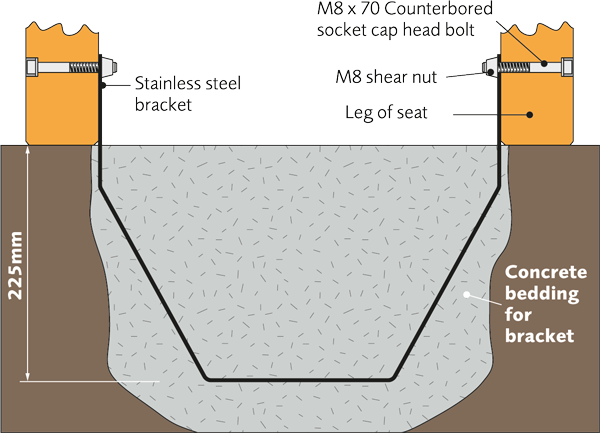 The counterbored holes for the 8mm socket cap head bolts are pre drilled in the seat, making installation straightforward. The seat is placed in position and the area to excavate marked out between the legs. After excavating the holes, the seat is returned to position with the brackets attached, the holes back filled with concrete, and the ground surface made good with macadam, paviours or concrete. 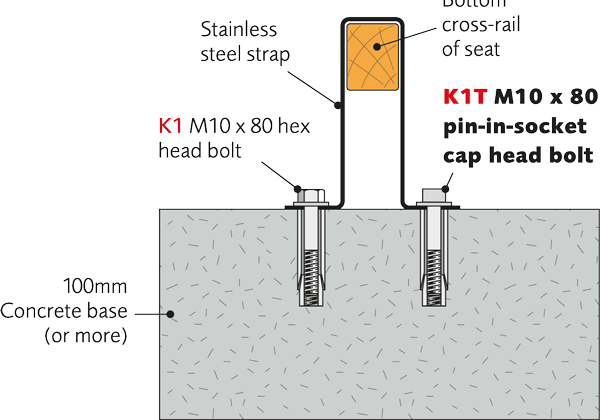 K19T has two brackets and four socket cap head bolts with tamper resistant shear nuts.